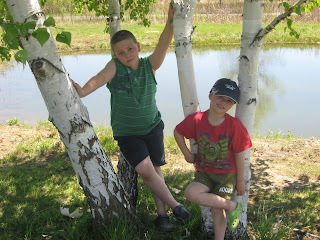 My friend Judie emailed me the other day to ask if everything was alright because it had been a month since I blogged...yes, everything is alright, just a normal week/month in the life of me...work is crazy, the kids are crazy, I'm crazy, DH is crazy! I've been so occupied with everyday life that I haven't had a chance to tell anyone about anything! DH started a new position with his employer, so he went from a swing shift to straight days. In the 12+ years we have been together we have only ever done straight days for him a week here and there so this is a new ballgame for all of us. Don't get me wrong, having him home each evening and weekend is great - most of the time. I know he finds it a huge change as there were days during the week before when I was at work, our oldest was at school and he and the little one could get lots of things done around the house or out and about in town. Now he has to try to get everything home related done in the evenings and on the weekends...a learning curve for sure (and cuts into his fishing/hunting/golf time). Cameron (our oldest) is needing the help of a chiropractor and that has meant three trips a week into Kingston (25 minutes each way) for the last three weeks and that creates a logistical nightmare for Mom. On top of that, our regular babysitter had baby # 5 almost a month ago and the little guy has been very sick so I had to find another sitter for Caleb in a hurry (because DH wasn't home at all during the week now) and get someone lined up for Cameron for after school. It all worked out and now we are set until the end of the school year. 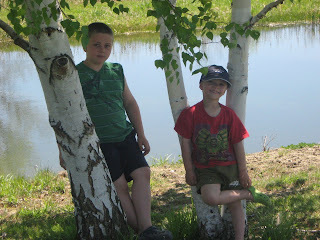 We have been thinking about what we were going to do this summer with both DH and I working straight days and knowing that we could not afford to have both boys at a sitter each and every week day all summer long. So we have acquired a "teenager" as the boys call her to come and spend the majority of the summer with us and stay with the kids while we are at work. This will help us financially and relieve some of the shuffling around stress that summer brings as well as she gets some cash to spend for back to school stuff as she heads off to high school next year. I have been stitching (I need to relieve stress somehow right?) and I even got away on Mother's Day weekend with Bonnie to Dani's for Friday night thru to Sunday morning. We had a wonderful, relaxing weekend and saw some friends I haven't seen in awhile - Lynn J, Beatrice, Kathy A, Christin and a new friend (with no blog) Lori. I got lots of stitching done before Bonnie and I had to head for home. We went to my parents first, Mom feed us lunch and then Bonnie left me in care of my DH and kids. Bonnie continued on her travels and my family packed up and did a quick trip home to drop our stuff before we went to the inlaws for supper and the evening. Work is busy....last night we launched our 2010-2011 season information, everything is now listed on the website if you want to take a peek at the wonderful season to come. This of course means lots of work for me, renewals for subscribers, setting up the shows for sales in the ticketing system and on and on and on. So, I'm here, I'm alive and looking forward to some time off this coming weekend, I do have to work on Saturday but with Sunday and Monday off I might get to sneek some stitching time in. Until next time, and I will try to update a little more often than once every couple of months. I'll leave you with a couple of pictures from this past weekend. 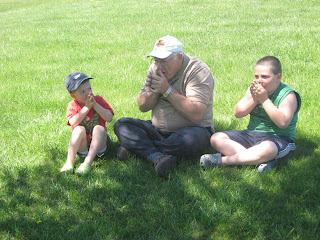 Here are the boys with their Poppa Brown learning how to "whistle with grass" which was too funny and my FIL was cracking up at both of them. Whew - what a lot to deal with hon. I don't miss those days. Glad that you are okay and the stress is getting smaller. Take care. Sending lots of hugs. Glad everything is Ok although you are soooo busy. See you at Sheila's stitching weekend. Hi there, sounds like you have a great time lateley. Isn't stress wonderful??? I have Lynn as one of my blogging friends, she said something about a stitching week end. Sounds like you had a good time. Our stitching retreat is in 8 days, we are all so liiking forward to 4 days of no schedules and stitching and stitching by the shores of Lake Huron. It does not get any better than that. We go on the same week end every year. This year we have 24 ladies signed up! Goodness the boys are getting big. Having the hubby home must be a huge change - have you wanted to strangle him yet? lol! I know having Scott home after him being gone for over a year was big for all of us, and our private time suddenly became very important. Which is funny as it never was an issue before. Oh how I remember those crazy times! I can imagine it would be a big change for Kurt now. Just make sure you manage to squeeze some time for yourself in there. You are one busy gal! Get in some stitches where you can!